Announced August 2016 at Tech Field Day. Brocade positions this as a router successor to the MLXe with about 15X more switching capacity. During the introductory session at Tech Field Day, Brocade was asked to spill the beans on the merchant silicon. Not clear that absent a direct question they would have said. The switch is the Jericho varient from the Dune family. 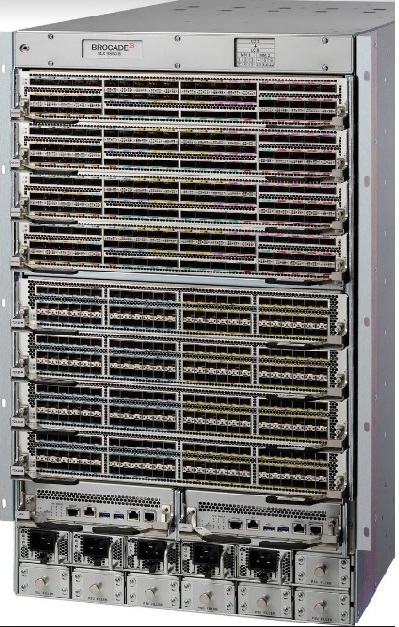 The Brocade SLX-9850 has an 8-slot (pictured here) and 4-slot version. There is also a fixed configuration model which presumably uses the Qumran chip without the crossbar interface. Within each type there are QSFP cards that can support 36 x 100G or 60 x 40G or 240 X 10G (with splitter cables). There are SFP cards that can support 72 x 1/10 Gb/s. No support for 25 Gb/s has been announced.